You can use sculpting brushes to polypaint. In the Draw palette, switch off Zadd and Zsub, and switch on RGB (although remember that you can polypaint and sculpt at the same time if you wish – such as for creating fine veins). Click the large Alpha thumbnail to the left of the canvas and choose an Alpha from the pop-up window. Open the Alpha Palette, click the large thumbnail of the Alpha and choose an Alpha from there. To learn more about Alpha Controls visit the Alpha Palette page. 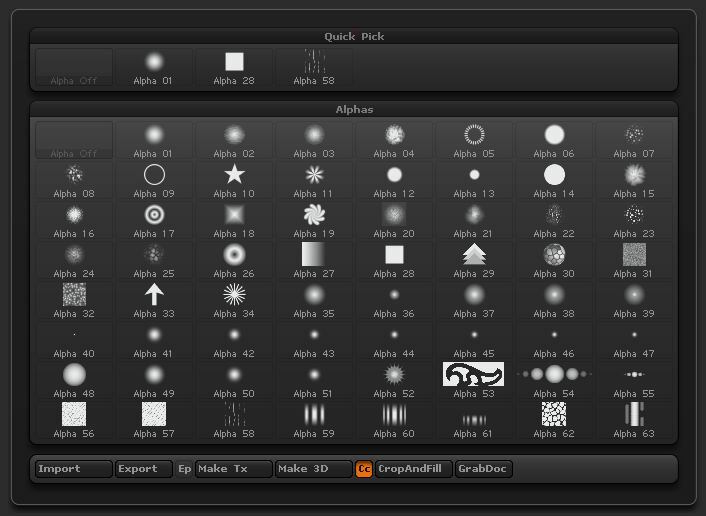 ZBrush has several different Stroke types available for the artist. Each is useful for a different task. In the Painting a Head section we learned about the Colorized Spray stroke. For sculpting, the Dots stroke, Drag Rect and the Freehand stroke are very useful. Some of the stroke options are not available while 3D sculpting. ZBrush’s interface is context sensitive. It will only show you the controls that you can use.